The Montague Plains Wildlife Management Area (MPWMA) is located in the Connecticut Valley of western Massachusetts in the Franklin County town of Montague. The MPWMA is owned and managed by the Massachusetts Department of Conservation and Recreation (DCR) Division of Fisheries and Wildlife (DFW) in cooperation with Northeast Utilities (NU). 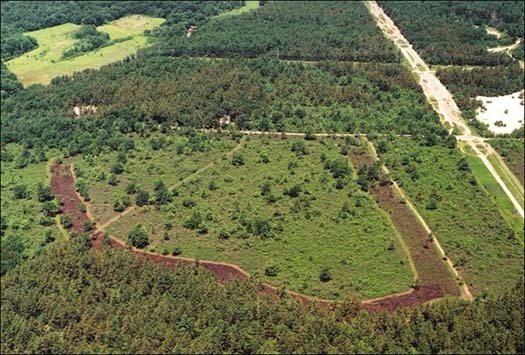 The primary purpose of the site is to protect and preserve an outstanding example of a xeric (dry) outwash pitch pine-scrub oak barren natural community, its associated biota and its ecological processes. Paleoecological evidence strongly suggests fire was a common occurrence on the Montague Plains from 500 to at least 2,000 years before European settlement. Throughout North America, prehistoric Native Americans used fire as a landscape management tool to increase browse and mast for game species, drive game, increase production in certain food-bearing plants, ease travel through the wilderness by clearing underbrush, communicate among groups, facilitate effective defense of their communities and territories, and, once agriculture was adopted, to clear and fertilize crop lands. Starting in 2000, small prescribed burns have been conducted on a portion of the Montague Plains WMA for ecological management and training purposes. 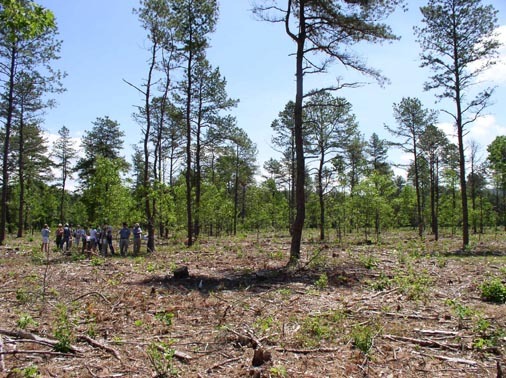 Two main areas of management and research have been ongoing at the Plains since 2000: pitch pine crown fuels characterization and crown fire behavior prediction, and scrub oak fuels and biodiversity management. 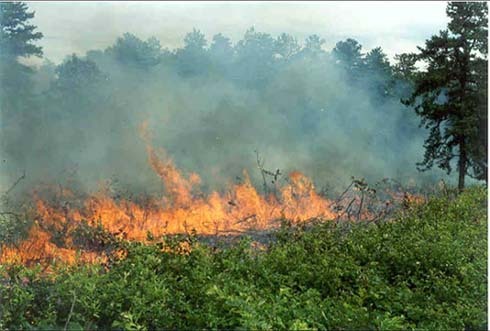 In spring 2000 we initiated prescribed fire management of scrub oak thicket fuels at the Bitzer Fish Hatchery Watershed Protection Area on the west side of the Montague Plain WMA. Initial burns had as their goal the establishment of a fuel break around the core area west of the Northeast Utilities transmission lines (see picture below). Since establishing the fuelbreak, we have conducted 6-8 burns per year for the past four years spanning all months between March and October. We have burned grassy-heath fuels, scrub oak thickets, and closed-canopy pitch pine, oak and aspen stands. Burn units range in size from less than an acre to 11 acres (see map below). 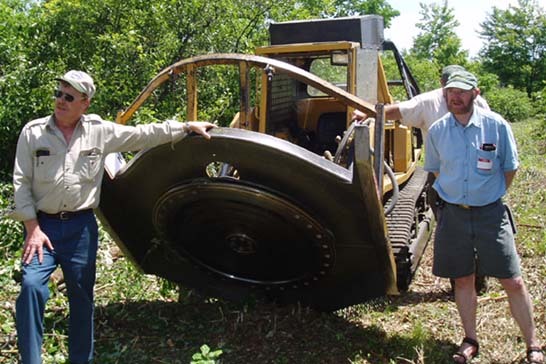 Firebreaks and access corridors were initially established by mowing with a Davco mower (at a cost of ~$300/acre), and in 2002 we began combining mowing (with the Davco) and burning treatments on some units. Our goal is to burn from 5-10 acres each year, and to spread the burns out throughout the year. We hope to re-treat units on 10-year intervals. Map of treatments in scrub oak units at the Montague Bitzer area. Click on the map to view treatment histories of individual treatment units. Map prepared by Matthew Duveneck. This practice of managing small units and spreading management practices out over the year lessens the impact on any given wildlife species. We assume that if species exhibit a range of sensitivities to our treatments, it is best if the treatments each comprise a small area and if they are applied throughout the year. This minimizes the adverse effects of the treatments while maximizing the diversity of the stages of scrub oak recovery. Vigorous young stands of scrub oak are essential habitats for several species of state-listed Lepidoptera. Mechanical treatments followed by prescribed fire reduce the time required to restore vigorous, young scrub oak stands from 6 years to less than 2 years. Prescribed fire alone in mature, untreated scrub oak fuels is accompanied by increased risk of escape and/or smoke management problems. Mechanical treatments cost $300/acre using a Davco mower. Photo of the Davco mower. Photo courtesy of Brian Kurtz. Results of our most recent treatments indicate that we can reduce live plus dead fuel loads in overmature stands of scrub oak from 25 tons/acre to 3 tons/acre in 12 months with a combination of mowing and burning. This is accomplished by mowing in the growing season, and then burning the area one year later. Photo of a prescribed burn at Montague in scrub oak that had been mowed with the Davco. Photo of scrub oak vegetation in the dormant season that has been mowed and burned. Photo by Bill Patterson III. 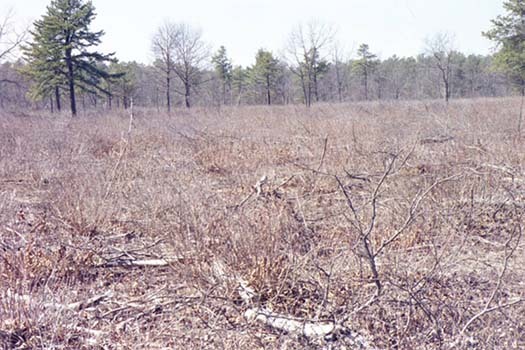 Photo of an untreated pitch pine stand, with high crown fire potential. Crown fire models exist to assist fire managers in predicting intensity and rate of spread in many coniferous tree species. The density of a crown fuel layer is related to the minimum spread rate of a crown fire. Canopy characteristics, which are inputs to the models, have, until now, never been measured directly for pitch pine. We destructively sampled 31 pitch pine stems (photo, right) from three sites and have developed regression models to predict available fuel weight data using tree diameter at breast height. Canopy Bulk Density, or the weight of canopy fuels per volume of canopy, can be used to predict Crowing Index – the wind speed at which active crown fire is possible within a specified fire environment. 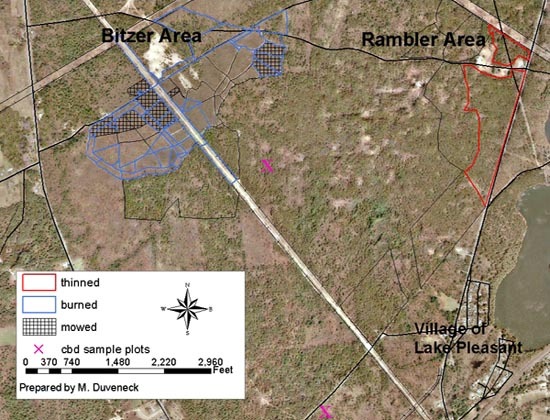 The locations of two of the Canopy Bulk Density can be seen on the map at the top of this page. With canopy bulk density predictions, we can model crown fire behavior using programs such as FARSITE or the nomogram shown below. By understanding the inputs to the crown fire behavior models, we can better apply management decisions to treat Pitch Pine stands prone to crown fire. 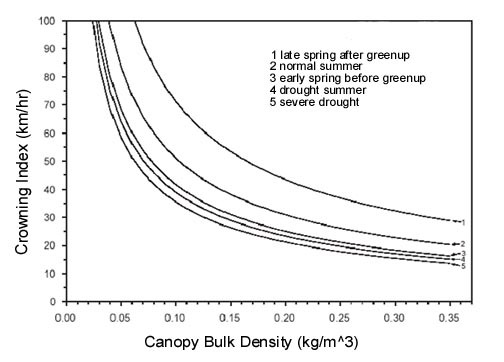 per volume of canopy) From Scott and Reinhardt, 2001. An ongoing project in pitch pine at Montague is looking at the variability in the moisture content of pitch pine needles throughout a given year. Every few weeks, researchers from UMass collect a sample of needles from pitch pines at Montague and calculate the foliar moisture content (FMC) as a percentage of their dry weight. FMC ranges from less than 100% for 2-year-old needles to more than 200% for newly-formed needles (see graph). In tracking the moisture content of the Montague pitch pine needles over more than six years, a pronounced deficit is consistently observed each spring, typically between late April to mid-May. This has important implications for increased crown fire hazard -- the drier the needles, the greater the risk of crown fire -- and has prompted further investigation. Recent research (see Grima 2009) has demonstrated that FMC declines as a function of the heat sum in air, a measure of growing season progress, reaching a minimum and then rebounding at a rate linear in time. The minimum occurs approximately when belowground plant growth activity (as measured by the heat sum in soil) is comparable in magnitude to the aboveground plant growth activity (as measured by the heat sum in air). Basically, cold soils inhibit the root system from replacing water lost by the actively growing aboveground plant causing the FMC of existing foliage to decline and reach a minimum before belowground plant activity begins to replace water. Average FMC values at the minimum for 1-year-old and 2-year-old needles were calculated as 109% and 99%, respectively. To assist managers with obtaining estimates of pitch pine FMC during this critical springtime period, a spreadsheet calculator has been designed to accompany daily temperature readings (see Methods). 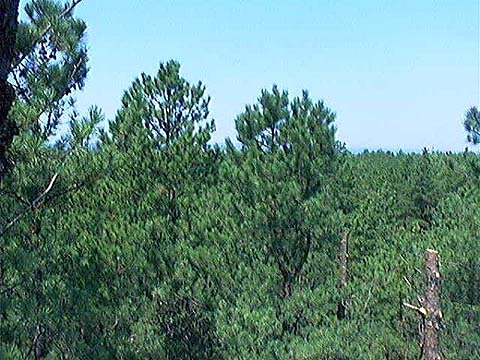 During the winter of 2004 the Division of Fisheries and Wildlife initiated applied research in closed-canopy pitch pine stands at Montague. The goal was to demonstrate the potential for reducing the threat of crown fires in mature Pitch Pine stands. Closed-canopy pitch pine stands at Montague have 100-170 ft2 of basal area per acre. Stocking in this stand was reduced to approximately 25-30 ft 2 per acre. 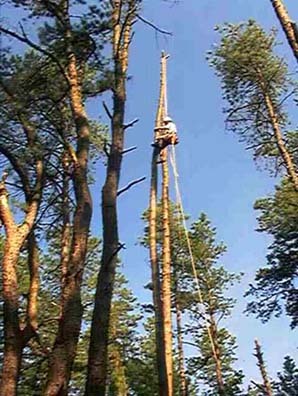 The stands were first treated with a Brontosaurus (a large machine that uses a chipper on a long boom to grind standing trees to the ground--click here to see a photo) to remove small-diameter stems. Next the larger stems were thinned with a feller-buncher. Finally, the Brontosaurus made one more pass through the stands to grind up slash. 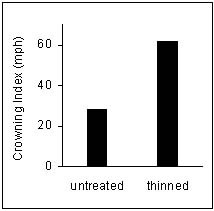 We estimate that the wind speed required to initiate active crowning increased from less than 30 mph to more than 60 mph as a result of the operation (see graph below). 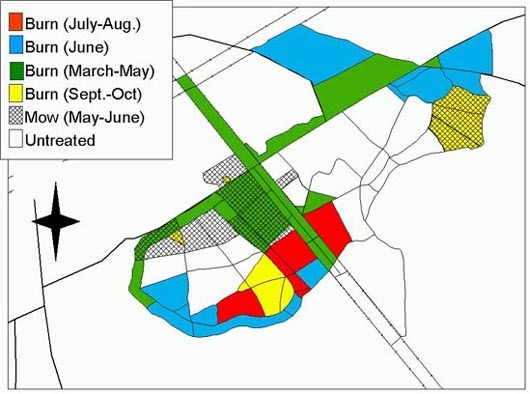 Trial FARSITE runs indicate that the operation would substantially reduce the likelihood that a crown fire would continue through the treated area (see simulation, below). Slash from the operation was ground with a Brontosaurus leaving nearly 24 tons/acre of highly compacted residual material on the ground (see table). This material, while substantial in quantity, does not present an immediate threat of wildfire because the fuels are so compacted that a fire could not move quickly through the area. FARSITE is a computer program in which fire can be simulated using BEHAVE fuel models and site-specific data. The above FARSITE simulation shows the predicted effect of thinning on fire behavior. When the fire, spreading eastward with a 25mph wind, runs into the treated pitch pine stand (shown in blue in the top figure), the fire changes from an active crowning fire to a fire in which individual trees are torching (see second figure). The rate of spread (third figure) and flame lengths of the fire (bottom figure) also decline when it reaches the treated area. For additional information on the work at Montague, please contact us. Our contact person at VCS has been Jeff Taylor.